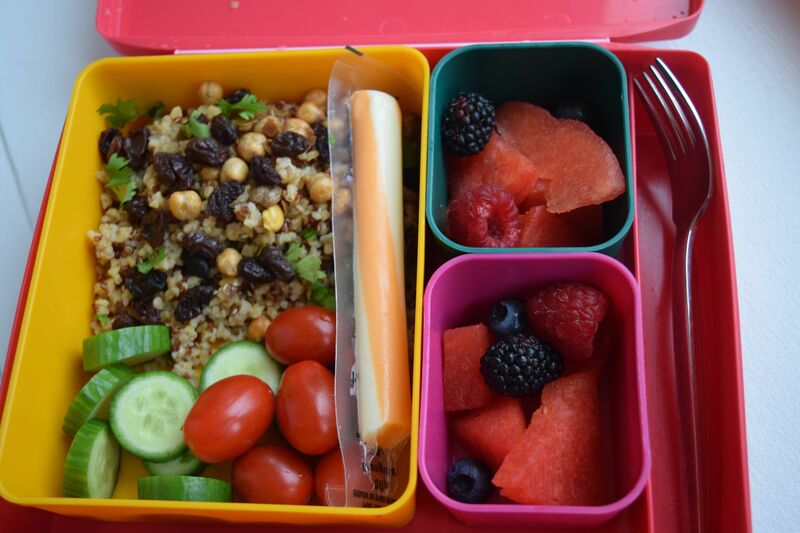 Letting children assist with packing their own lunches can be beneficial. You can teach your children about responsibility and portion control and boost their creativity and decision-making skills by inviting your children into the kitchen with you for a lesson. Here are five benefits of allowing children to help prepare their own lunches. It emphasizes portion control. 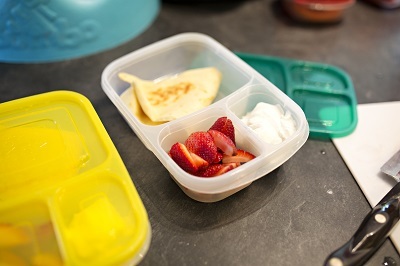 Bento-box lunch containers are an easy and exceptionally helpful tool for teaching your child about portion sizes and meal organization. 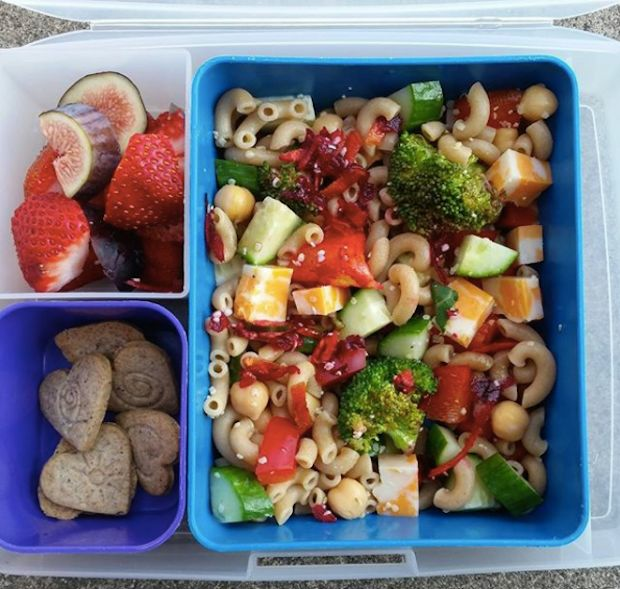 When your children select their lunch items with you, provide them with a bento-box container and explain what healthy meal portions look like. 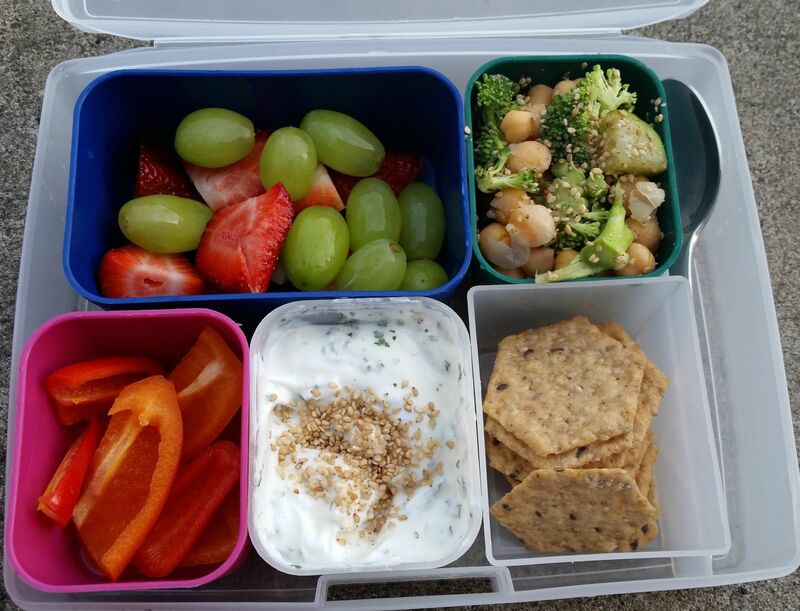 They can use the bento box to pack their lunches, which helps them visualize and be aware of the portion sizes they are packing. It introduces the importance of nutrition. Your children’s favorite go-to treats, such as fruit snacks and cookies, don’t necessarily make some of the healthiest snacks. When they’re in the kitchen with you, teach them about what the key food groups are and how those food groups keep their minds and bodies well nourished. Provide different vegetables, fruits, proteins, grains and dairy products, and let them choose what to put into their lunch bags. Guide them to pack meals with all the food groups. It aids in independent learning and decision making. When your children are preparing their lunches with you in the kitchen, give them options for what to pack. Allow them to choose from two or three different things. Do they want a chicken sandwich, a turkey sandwich or a peanut butter and jelly sandwich? Do they want carrots or cucumbers? Do they want strawberries, apples or grapes? Once they decide, let them gather and pack their choices, and then help them focus on the next food group. Once you establish a routine, they will make quicker decisions. Picking their own meals lets them feel independent and accomplished. It boosts creativity and introduces the art of cooking. Getting your children into the kitchen at a young age helps them start cooking and learning the steps it takes to create a meal. Instead of providing them with premade and wrapped turkey sandwiches, let them make some with you. Start by letting them select the bread, get out the condiments and select the meat, cheese and toppings they want on their delicious sandwiches. This shows them how much time, effort, creativity and skill it takes to make a proper lunch. It teaches responsibility, routines and time management. Whether you pack meals after dinner or after your children get home from school, make sure to schedule a meal-preparation time that works best for your family. Meet in the kitchen at your designated time, and start preparing the lunches. By establishing a routine, such as meeting every night or twice a week at 7 PM, you will be familiarizing your children with following a schedule, helping them plan meals. If you want to make meal preparation more fun, consider getting a small chalkboard or whiteboard to keep in your kitchen. Have your children write out the days of the week and the foods they want in their lunchboxes each day. This can keep you organized, and it encourages your children to start planning meals. We all know that kids have energy to spare—the question is, what’s the best way for them to burn it? Is it better for kids to join a gym, or play a team sport? While it may seem like the best thing to do is just let them run in circles in the yard like puppies, the fact is, there’s a time and a place for different physical activities in a kid’s life. This article was written by Melanie Mannarino from Real Simple and was legally licensed through the NewsCred publisher network. Please direct all licensing questions to legal@newscred.com. Before signing your kid up for ALL the activities, take a look at these recommended sports based on your child’s personality. When you think of your child and sports, do you feel a little bit of dread? Weekday practices or long game days on the weekend are a commitment when you don’t know if your kid will even enjoy the sport you choose. Plus, it takes time to research which classes or leagues in the area to even sign up for. You might just pick the sport that seems easiest or that you’re most familiar with—or hesitate to sign up your child at all. But what if you could find the perfect sport for your youngster, without having to invest a lot of extra energy? You can. Although every kid is unique, there are four energy types among children—and a good sports match for each that fits their needs and personality. Your child’s type, which is the general way they move through the world, affects everything they do: playing, talking, eating, sleeping, and even playing sports! By reading the types below, you can find which sports are most supportive to your kid. This kid needs to keep things light and interesting. They may prefer a wide variety of sports. If the sporting experience gets too serious, the coach is too serious, or the parents are too serious about it, this pressure causes them to be in a heavy, stressful state. They will resist wanting to participate. My Type 1 son loved all sports, excelled at team sports like baseball and football, and enjoyed the social aspect and cheering on his teammates. This youngster needs to keep things comfortable. If the sporting experience or coach is too intense, or the parents are too intense, a Type 2 child will shut down, and his or her ability to perform successfully will be affected. My Type 2 daughter would have benefited the most from me knowing her energy type when she was in grade school. I made the mistake of putting her in girl’s softball. She felt so much pressure when she was at bat that she couldn’t even swing. She would have performed much better in dance classes. This kind of kiddo needs to feel like they can win! If the sport has too much of a learning curve and they are not seeing results consistently, if the coach does not acknowledge their progress with enthusiasm, or if the parents are not interested or not making a big deal about their Type 3 child’s sporting accomplishments, it will hinder this child’s experience. The lack of enthusiasm for the results a Type 3 child is achieving will cause them to be disinterested and bored with the sport. I did not raise a Type 3 kid, but reflecting on my own childhood, I would have loved participating in sports. I now give that to myself as an adult with competitive tennis. This child needs to feel they can be their own authority and have support for perfecting their sporting performance. They may prefer to focus on only one or two sports that they can hone. If they are feeling like they don’t have a say, that they are being told what to do by a coach or a parent, or if they cannot see their improvement in their performance, this type of kid will lose interest. They may even rebel by not wanting to be a part of the sporting experience. My Type 4 son loves the outdoors and sports that require technical skills and fine-tuning! He currently competes in mountain-bike racing. 1. Let your son or daughter show you which sport is best for them. In the world of professional sports, I see all types of people succeeding in all types of sports. There are some tendencies for certain types to be drawn to certain sports, since they match their true nature, and they can use their natural gifts in their sport to create successful outcomes. For example, in the world of pro tennis, there are more Type 4 pro tennis players than any other type. It’s not a constant though, as there have been successful pro tennis players of all types. So rather than letting your child’s type determine the sports they might succeed in, let your kid teach you what sports are interesting to them. Just make sure to support them in creating the experience to be true to their nature from these tips. 2. Realize not all children will want to play sports. That’s OK! Not all boys and girls will want to pursue music either; every child is different. Remind yourself that the goal of a kid in sports is to support the healthy development of their physical, emotional, mental and spiritual self. It’s not to prepare them to be a collegiate athlete or professional athlete. When we remember this, we can show up to help them create a positive experience that is perfect for that child, and it won’t look the same as the next kid. 3. Get behind your child’s desire to pursue a sport and see what they do with it. I recently had a young man—about the age of 13—come to our home selling discount coupons to a local restaurant. For every coupon he sold, he kept a portion of it to devote to his junior car-racing pursuits. He had a beautifully printed postcard with a picture of him and his car, and an explanation of what he was raising the money for. It wasn’t a restaurant I would probably go to but I just had to support this young man. I applaud his parents, who did not shut down this boy’s dream to pursue a sport, and allowed him to find a way to finance it. It’s important to be attuned to the sports and activities your kid may enjoy and find ways to support your child’s energy type as they pursue their interests, sports or otherwise. Carol Tuttle is the CEO of Live Your Truth, LLC, and author of the best-selling parenting book, The Child Whisperer: the Ultimate Handbook for Raising Happy, Successful, Cooperative Children, which has sold over 75,000 copies worldwide. She also hosts an immensely popular parenting podcast that hits weekly on important parenting issues commonly experienced by families of all backgrounds. For more information, please visit, thechildwhisperer.com. This article was written by Carol Tuttle from Working Mother and was legally licensed through the NewsCred publisher network. Please direct all licensing questions to legal@newscred.com. Want to Boost Your Child’s Health? Make These Easy Swaps Today! As a parent, you probably spend a lot of time thinking about how to help your little one grow up happy, healthy, and strong. Sometimes though, despite our best intentions, our kids can form habits that aren’t the healthiest. Whether grandma has your little one hooked on sweets or business forces you to hand over the iPad while you finish cooking dinner, it’s easy for your tot to form habits that won’t serve them well in the long run. Developing a love of physical activity, a taste for fruits and veggies, or a desire to spend time reading can impact them for their entire life. Check out the health swaps below to find out how to easily bring health habits into (or back into) your little one’s life. While most kids do enjoy the taste of juice, the American Academy of Pediatrics now says that little ones simply don’t need it. Besides adding lots of empty calories to a child’s diet, filling their tummy with juice can make them feel full and less willing to eat nutrient-rich foods. Make the swap by diluting your babe’s juice with increasing amounts of water until they’re drinking 100% water again. Many parents offer cookies, chips, or snack crackers as a first option when their little ones complain of hunger. Instead of offering these sorts of snack foods, consider offering fruit instead. Not all kids like all fruit, but many find the (naturally!) sweet taste of apples, grapes, or melon to be delicious! There’s plenty of evidence that kids who spend too much time using screens struggle in ways that their screen-free peers don’t. Consider offering your child engaging activities that don’t involve a screen. Many kids enjoy arts and crafts, listening to audio books, or flipping through their favorite books. One way to get kids moving is to get them outdoors. Because of the limited space indoors, many indoor activities are somewhat sedentary. By moving playtime outdoors, you’ll be giving your child the physical space they need to run, jump, and play! This article was written by EverydayFamily from Everyday Family and was legally licensed through the NewsCred publisher network. Please direct all licensing questions to legal@newscred.com. Most moms are aware of the need to keep their children healthy to ensure proper growth and development. However, when the demands of the day limit your time, sometimes being healthy isn’t as convenient. When you’re at work all day, it can be easy to develop poor habits just to ease the stress. Things like preparing healthy meals, making sure the kids stay active, and even keeping up with doctor’s appointments do require a bit of time and effort, but are important. If time prevents you from being able to keep your family healthy, consider these time-saving tips below. Any mom would agree that when you’re pressed for time, one of the most time-consuming tasks is preparing meals for the family. Bogged down by demands from work, household chores, and perhaps running the kids around to their after-school activities, it’s much easier to order takeout or grab a kids meal from a fast food restaurant and keep moving. Though a treat every now and again won’t do the kids any harm, often time the quickest meal solutions are the unhealthiest for them. To cut back on time and the number of processed foods and saturated fats your family is consuming, why not pick one day to prep meals? Choose a day where you have the most time and cook all your meals. You can then place them in plastic containers and freeze them for the week. Visiting the doctor periodically – especially during school-age is imperative for children. Annual physicals, vaccines, and shots, as well as other medical services, allow doctors to provide you with the best child development & nutrition resources to ensure your child is developing properly. Doctors can also recommend adjustments in nutrition, supplements, and ways to help your child grow in confidence, like giving your child Healthy Height’s nutritional shakes that promote growth in height. Be that as it may, most working mothers are plagued with minimal time off from work. Not to mention, a scheduled doctor’s appointment tends to last longer than anticipated, which can cause conflict. If you work in an environment where time isn’t flexible, try to kill a few birds with one stone. Take off one day instead of trying to break it up into hours. Schedule the entire family’s appointments for the same day. While it will mean sitting in waiting rooms all day, it eliminates the need to take off several hours every few months. It can be tempting to let the kids sit in front of the television or on the computer all day while you tend to the household chores (or take a break), however, too much screen time is detrimental to your child’s health. It is important for all of you to get active to remain healthy. If time prevents you from being able to get the kids out, consider working out together. This doesn’t mean you have to go to the gym together or sit in front of the television doing exercise video moves either. There are a lot of fun activities you could try indoors or outdoors to get active. Whether you go outside and play basketball or stay in the house and rock out to your favorite dance simulation game, you’re moving, sweating, and working out. Not to mention, you’re creating fun memories with your family. Unfortunately, time isn’t something we can make more of. All you can do is learn how to make the most of the time you have. If you’ve been trying to prioritize your family’s health, but find time to always get in the way, utilize the above-mentioned tips. They are all convenient solutions that not only save you time but allow you to ensure your family is as healthy as they can be. Fads like barefoot running and IV drip bars may be fun to read about — and there’s no shame in giving them a whirl — but jumping on these bandwagons won’t necessarily lay the foundation for a healthy lifestyle. Really, simplicity and repetition still reign, which is why it’s good to build healthy habits into your day. Here are a few easy ones to try each morning if you want to start your day on a healthier note. Instead of going straight for the caffeine, start with a hot cup of water. It may not taste like much, but doing so can improve blood flow, aid in digestion (perfect after a Sunday brunch) and even cleanse the body of toxins. Plus, it helps you meet your water quota. Speaking of which, make sure you have a water quota. Try to get an equal amount of protein, fiber and produce at breakfast. Of course, eggs are a go-to protein. And if you’re not one to make breakfast every morning, hard-boil a batch to eat throughout the week. Just make sure you buy high-quality eggs from vegetarian-fed hens, such as Eggland’s Best. Its eggs have twice as much vitamin B12 and omega-3s, six times the amount of vitamin D and 25 percent less saturated fat than ordinary eggs. Try them in a huevos rancheros-inspired chopped salad for breakfast and be on your way for the day. Don’t diss meditation until you try it, and don’t feel like you have to be floating on a cloud, om-ing or burning incense while you do it. All meditation requires is to sit still in a comfortable position and tune into your body. You can try these five-minute techniques or download an app that guides you (try Simply Being). You can rise early for an intense HIIT class, or you can simply take a walk down your block. The point is to get moving. In one study published by the American Medical Association, simply increasing walking pace reduced the risk of developing type 2 diabetes in study participants. Furthermore, a 2008 study published in Medicine and Science in Sports and Exercise concluded that if more people walked more often, it could help reduce the prevalence of chronic disease. Here’s the super-unofficial definition of a superfood: a food that’s more nutrient-rich than other nutrient-rich foods. We’ve got a handy superfood list you can take to the grocery store, but for breakfast, think blueberries, strawberries, almonds, apples and avocados — for extra nutrients, try these baked eggs and avocados. Your mission: No matter what you eat for breakfast, pick one superfood side. Just think about how that adds up over time. Instead of rolling out of bed, getting ready and jamming out the door to make it to work, take a beat. Allowing yourself time in the morning to just be can help you handle the stress that may come with the rest of your day. Enjoy your hot beverage of choice, read a book or stretch as you reflect on yesterday. This is that “me time” you’ve been craving. Sure, sometimes kids, unexpected situations and life in general can get in the way, but does that mean you shouldn’t try? If you think about it, that time spent in the shower could really be maximized. While you shampoo, set some intentions for your day. They don’t have to be about exercising or eating healthy at all. It can be as simple as this: What do you want to accomplish today? What will make you feel fulfilled at the end of the day? Reflect on how you’re feeling. Self-care reduces stress, and less stress makes you healthier. So, while it’s pretty hard to drill “healthy” down to one definition (it’s not exactly a one-size-fits-all situation), it’s also hard to deny that committing to a handful of simple habits can make a difference. They’re tried and true and completely good for you. This post is sponsored by Eggland’s Best. This article was written by Catherine Conelly from SheKnows and was legally licensed through the NewsCred publisher network. Please direct all licensing questions to legal@newscred.com. “For an after-school snack, my kids have enjoyed fresh fruit like banana or any combination of cut-up cantaloupe and grapes and berries (e.g., raspberries, blueberries or strawberries) plus warm cashews. They’ve also enjoyed Triscuits and cheese, and plain low-fat yogurt with berries, or unsweetened applesauce and a sprinkle of cinnamon.” ― Elisa Zied, a certified dietitian nutritionist and author of Feed Your Family Right! A group of nutritionists shared the general guidelines and kid-approved picks they use in their own homes for after-school snacks. But how do you choose a snack for your kids that will fill them up enough to stop the “when’s dinner ready?” nagging without spoiling their appetites or loading them up on empty calories. The lag between lunch at school and dinner at home can feel like a lifetime to kids. The after-school snack, therefore, is a time-honored tradition in many homes. 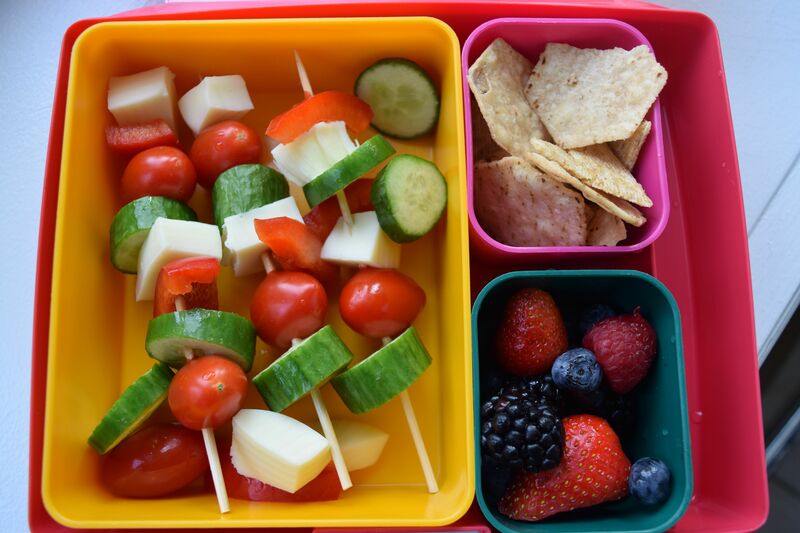 Nutritionists share the go-to snacks they feed their kids. Apples with peanut butter or cheese is one snack option. Tea can help with hydration. A baked sweet potato can be the base for a snack. Air-popped popcorn can be a fun snack. These quotes have been edited and condensed for clarity. This article was written by Caroline Bologna from Huffington Post and was legally licensed through the NewsCred publisher network. Please direct all licensing questions to legal@newscred.com. 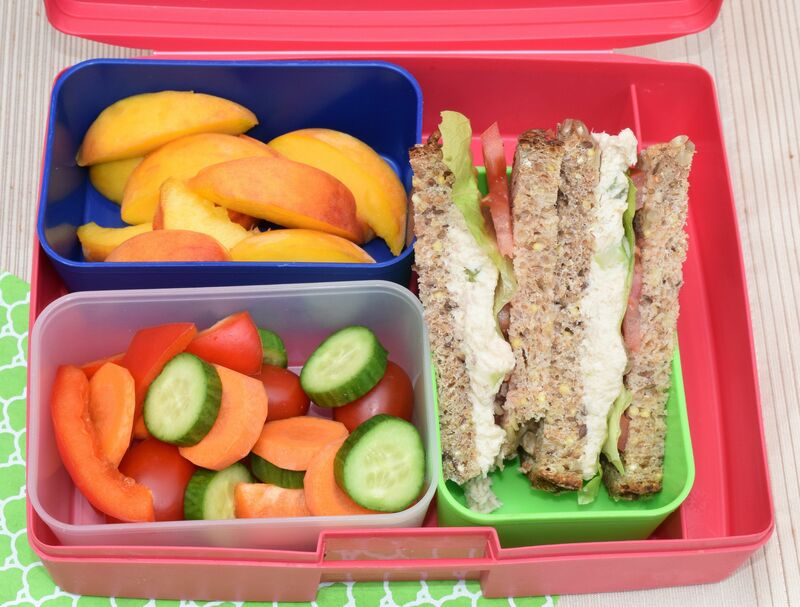 Kids aren’t exactly known for their refined palates, which can cause issues for parents who want to pack healthy lunches for them to take to school. But delicious and nutritious options are available ― and they don’t always take a long time to put together. 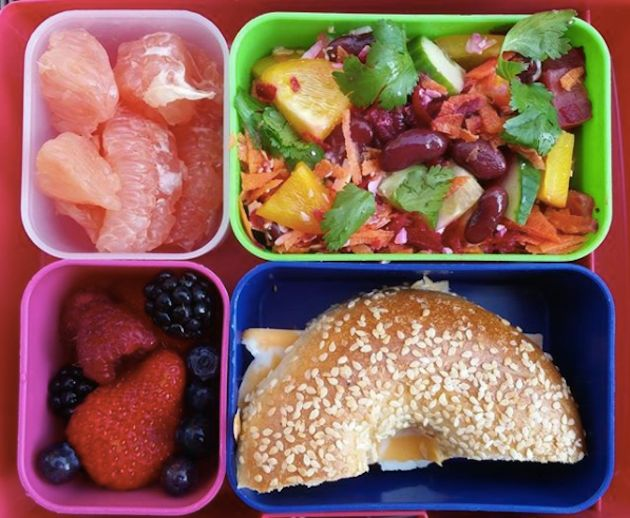 HuffPost asked a group of nutritionists what they pack in their children’s lunch boxes, and they shared their general guidelines and kid-approved dish ideas. “My background in nutrition has taught me that kids fare better in school ― both academically and physically ― when their lunch is nutritious and provides long-lasting energy. That’s why there is always a source of good-quality protein in their lunchbox (chickpeas, cheese, Greek yogurt, chicken, lentils, etc.) and some slow-burning, high-fiber whole grains, like quinoa, whole-grain pasta or oats. “When I’m building my kids’ meals I think about variety, temperature, texture, flavor and of course nutrition. Lunch is usually one of the following with a side of fruit and vegetable: bean and rice burrito, veggie dumplings (tofu and cabbage), soup with a side of fruit, spinach and cheese tortellini with a nut-free sauce (the school has a strong nut policy), homemade salmon salad with carrots and celery topped with tzatziki on a whole wheat English muffin, or a spinach and potato patty inside of a whole wheat English muffin.